I’m doing things differently in the polytunnel this year. Gone are the days of wonky bamboo canes that inevitably poke me in the eyes, head and/or face. The future is string! At least, I hope it is. I planted out all my tomato plants at the weekend, using a new system that I hope will increase my harvest, reduce the risk of diseases, improve watering and take the frustration out of using those bloomin’ bamboo canes. First of all I cleared out the clutter and took down the growing station where all my seedlings were growing. You wouldn’t believe how many seed trays and propagators I found! I prepared the ground by giving it a good soak and lightly dug in some manure and multi-purpose compost. For each tomato plant I made a watering well using water bottles, the really big bottles and even some protein powder tubs. So I drilled a bunch of holes into the sides and bottom of the bottles. The idea is that you bury the bottle with the plant, water from the top of the bottle and the water goes straight down to the main root system, rather than running off the surface or barely reaching the lower roots. When you’re satisfied that you’ve done enough power-tooling, dig a hole into the ground that is deep enough for the bottle to stand at a slight angle to the tomato plant. The ground level should be in-line with the neck of the bottle. 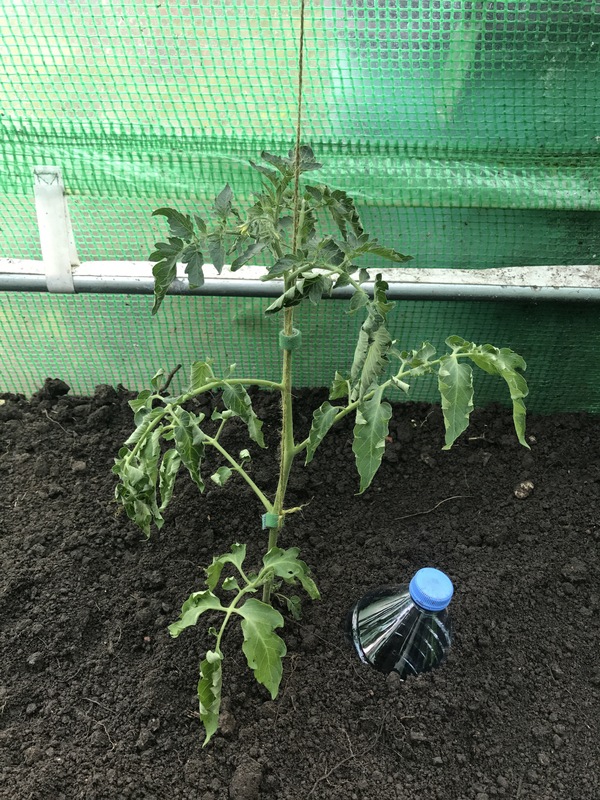 I had to remove a few leaves from the tomato plant but thats ok, the deeper you plant it, the more roots will grow of the stem giving you a stronger plant. Replace the soil and press the tomato plant into the ground. Next I cut about 3-4 metres of garden twine. I know its sounds a lot, but if I need to lower the plant or train it up the polytunnel roof I’m going to need it! I connected the string to base of the tomato plant with some awesome velcro strips that I’ve just discovered. You can get three rolls of the stuff from Poundland. So rather that tying string around the plant which can cut into and damage the stems, I looped the velcro around the stem and tied the string to it. I should point out that I pre-tied some bamboo canes to the roof of the polytunnel which run down the entire length. 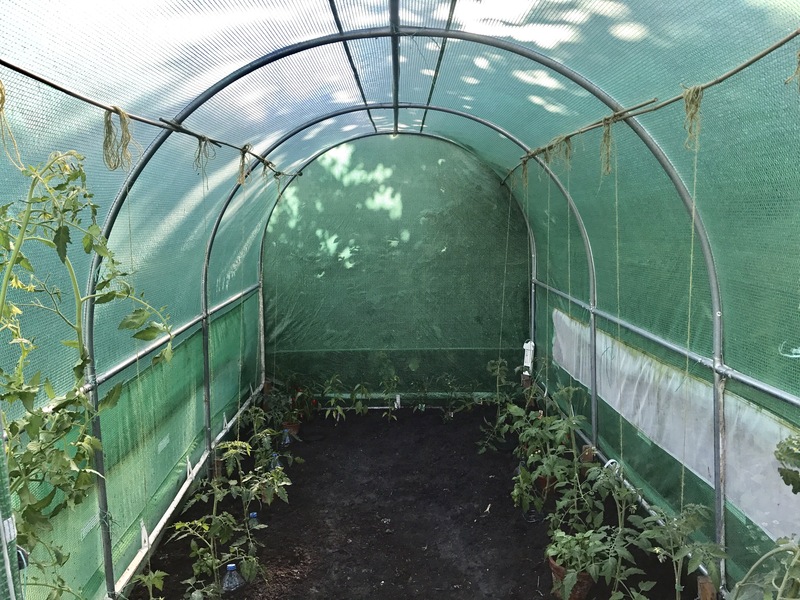 The ends have protective caps that prevent the canes from piercing the polytunnel cover. I took the string from the plant and tied it to the cane on the roof. With just another tie in place, the tomato plant is now securely in the ground and supported by the string! All that was left to do was give the plant a well-needed drink (it was really hot that day, hence the wilt!). Not only did I water through the bottle, but also on the ground surface to help establish the tomato’s new position in the polytunnel. Let me know in the comments if you’re using a similar system and tell me what tomatoes you’re growing!